Welcome to a special episode of Wildstorm Addiction! 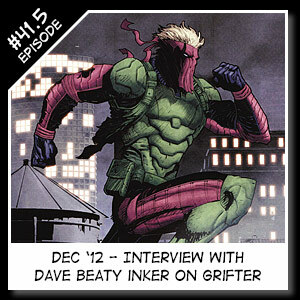 Our resident Wildstorm experts Joe David Soliz & Benjamin Murphy give an interview with the current inker on Grifter, Dave Beaty. We chat with about the rise and fall of this Wildstorm character in the new DCU 52. This entry was posted in Wildstorm Addiction and tagged Dave Beaty, Grifter, wildstorm by addict. Bookmark the permalink.